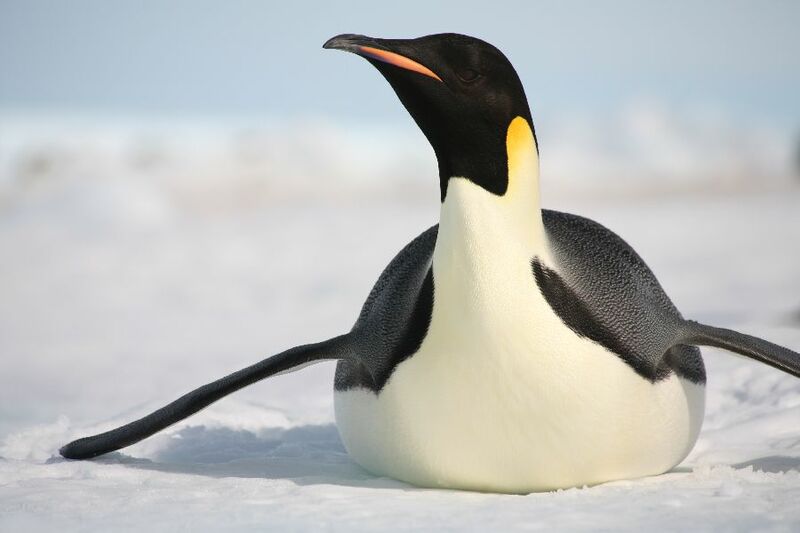 MISSION ESL COMPUTER LAB: "Emperor Penguin: The World's Greatest Love Story" from VOA. "Emperor Penguin: The World's Greatest Love Story" from VOA. I'm Steve Ember. And I'm Faith Lapidus with EXPLORATIONS in VOA Special English. Today, we tell about a very special bird called the emperor penguin. This bird struggles to survive in one of the most extreme climates in the world. There are seventeen kinds of penguins in the world. All of them live in the southern hemisphere. Only a few species live on the continent of Antarctica at the bottom of the world. 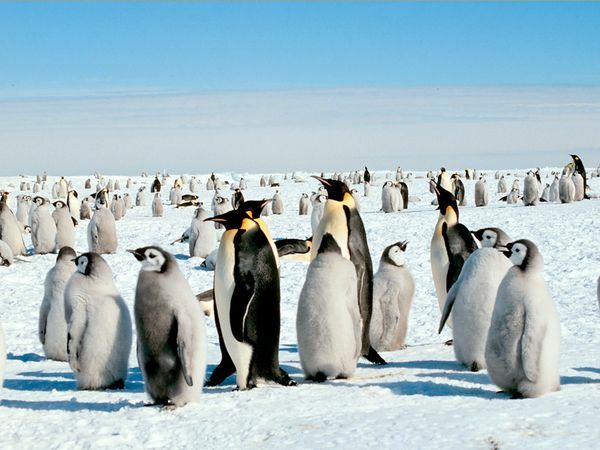 The emperor penguins are the largest. They are about one hundred centimeters tall and weigh about thirty kilograms. Their special method of mating makes them different from all other penguins. 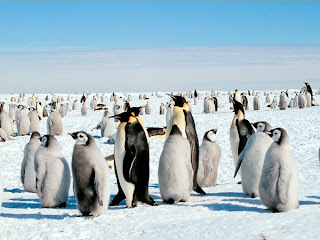 For thousands of years the emperor penguins have lived on the freezing continent of Antarctica. These black and white birds live in large groups or colonies. 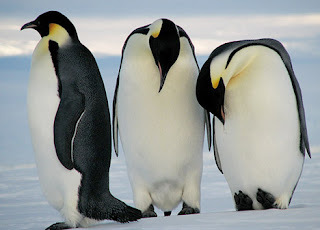 There are about forty emperor penguin colonies on Antarctica. In total, there are about four hundred thousand birds. These birds spend the summer swimming in the ocean in search of food such as fish and squid. Penguins are not able to fly, but they are excellent swimmers. They can dive as deep as four hundred and sixty meters and hold their breath for up to twenty minutes. But when summer ends, so does this easy time spent by the water. The penguins jump out of the water and onto the ice. They know it is time to find a mate and reproduce. In order to mate, the penguins must travel many kilometers inland from the ocean. They do this to find a safe area to spend the many months needed to produce and develop an egg. They must find an area with some shelter from the freezing winds. Hundreds of penguins walk in a single line for up to seventy kilometers to find a mating place. This trip is a long and cold one. Winter is beginning. The days are getting shorter and temperatures are quickly dropping. The trip takes many days. The birds must walk carefully on their short legs through icy areas. When their feet get tired, they slide themselves on their stomachs across the ice. Once they arrive at the right place, the mating process begins. Males and females walk around and make singing noises as they decide on a mate. They must also memorize their mate's special song. Penguins are unusual because they stay with the same mate for the entire period of producing a baby penguin or chick. After the female produces an egg, she must carefully slide it onto her feet. Then she must pass it to her mate. This can be a very difficult act. If the birds are not careful, the egg will fall on the freezing ice. If the egg touches the ice or breaks, the chick will die. All of their hard work will have been wasted. Once the female passes the egg to the male, he places it on his feet and protects it with his body. Both male and female penguins have a special place on their body to protect their young. A piece of skin under their stomachs forms a pocket or pouch where an egg or chick is protected from the cold. The male penguin incubates the egg for about two months. This means that he keeps it warm while the baby penguin inside the egg develops. During this time, the mothers must leave the colony and walk many kilometers back to the sea. The females are tired from mating and producing an egg. They are also starving from more than one month without food. During this period, female penguins can lose up to one-third of their body weight. Many do not survive the long walk back to the sea. The ones that do survive dive into the ocean to catch fish. They eat for several months to gain weight. They must also get food for their chicks. While the mothers are feeding, the hundreds of male penguins work together to survive. They stand very close to one another to form a tight group. This helps them keep warm. They continuously change places. The colder penguins on the outside of the group move to the warmer places on the inside of the group. Winters in Antarctica are difficult for the penguins. There are only a few hours of sunlight a day. Temperatures can drop to minus fifty degrees Celsius. Air masses called catabatic winds blow over the continent at speeds of up to two hundred kilometers per hour. The penguins have developed special bodies to survive such freezing temperatures. They can control their body temperature with a special system of blood exchange. The centers of their bodies keep warm, while the outer parts of their bodies stay almost as cold as the outside temperatures. Another way they survive the cold is by releasing a special oil from their skin. This oil helps waterproof the feathers that cover their bodies. A layer of air between their skin and the oil provides protection from the cold. Also, they have a thick layer of body fat that further protects them from the cold. Two months later, the females return to the colony and must find their mates. Many of the chicks have hatched and come out of their eggs. The family is united for the first time. However, the father must leave immediately to go feed in the ocean. He has not eaten for more than three months and has lost a great deal of weight. Before he leaves, though, he must learn the voice of his chick. The chick also memorizes his father's voice. When the father returns, he must be able to identify his chick in order to bring it food. The male and female penguins continue to take turns caring for their chick and bringing back food from the sea. When the chicks are about one month old, they start to spend time outside their parents' pouch. When they get bigger, the chicks stay together in large groups. Their parents still bring them food. But when they are about five months old, the chicks must feed themselves. They make their first trip to the ocean. However, not all the chicks survive this long. About twenty-five percent die due to starvation or cold. Some chicks are hunted and killed by large birds called giant petrels. However, if the chicks survive their first year, they generally live through adulthood. When they reach the age of five years, it is time for the young penguins to mate. A new generation begins this special mating process of travel and survival. In two thousand five, a French filmmaker named Luc Jacquet released a film about these special birds. The film is called "March of the Penguins." It beautifully shows how the birds survive in the extreme environment of Antarctica. This rare look at their lives is truly special. You can see the penguins walking across the white ice of Antarctica. Diving deep into the ocean waters. Moving their egg carefully from the mother's feet to the father's feet. Crowding together to keep warm in a snowstorm. Kissing their newly hatched chicks. "March of the Penguins" is the first full-length film to show the life of the emperor penguin. The crew chose to film a colony of penguins that was near a scientific research center. This way, the filmmakers had a base where they could live. They were also able to cooperate with the nearby Institute for Polar Research. Producing this film was very difficult. The movie crew had to survive the extreme cold for a whole year of filming. If the weather was too bad, they could not go outside and film. Also, trying to film the birds from very close up was not easy. The filmmakers had to be very careful not to harm the penguins. They made special devices that helped them get close to the penguins without interfering with them. Luc Jacquet even hired a specialist to film the underwater scenes. "March of the Penguins" was difficult to make for other technical reasons. The crew had to have special cameras made that could work in extremely cold temperatures. Also, they could not watch what they had filmed. This is because they did not have the equipment to develop the film. So, they had to remember the details of every picture they took and hope they turned out well. When they finished filming, they had more than one hundred twenty hours of film. Director Luc Jacquet says his film crew had to treat the penguins with care and consideration. He says his movie is a story of bravery and excitement. He also calls his movie about the emperor penguins one of the most beautiful love stories on Earth. This program was written and produced by Dana Demange. I'm Faith Lapidus. And I'm Steve Ember. Join us again next week for EXPLORATIONS in VOA Special English. 1. 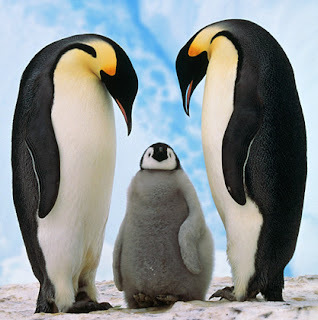 Emperor Penguins begin to mate and bear chicks __________________ . 2. When a penguin father returns, he can find his chick by the chick's ____________ . 3. The word "hatch" means ___________________________ . 4. __________________ are not a threat to newborn chicks. 5. Probably the least difficult part of producing "March of the Penguins" was ____________ . 6. Director Luc Jucquet calls "March of the Penguins" one of __________________ love stories on earth. 7. If chicks survive their first year, they ________________ adulthood. 8. A special oil penguins release from their skin helps to _________________ . 9. "Catabatic" is a type of _____________________ . 10. While the mother penguins are feeding in the sea, the male penguins ___________________ . Luc Jacquet calls his movie about the emperor penguins one of the most beautiful love stories on Earth. Why does he call his movie a beautiful love story? Discuss this question with a friend or partner. Or, write your answer in the comment field at the end of this post. Here is the trailer for the film, "March of the Penguins"